It’s a good read, now I have to go and try it out!!! Just want to know, maybe is a silly question, but do you still open on Sunday, and also do you deliver to the south west of Sidney. Hi Marina. We do home delivery for large orders ($48 minimum) ever Sunday, and we also do pop-ups at varying locations and are trying to lock in some regular farmers markets. 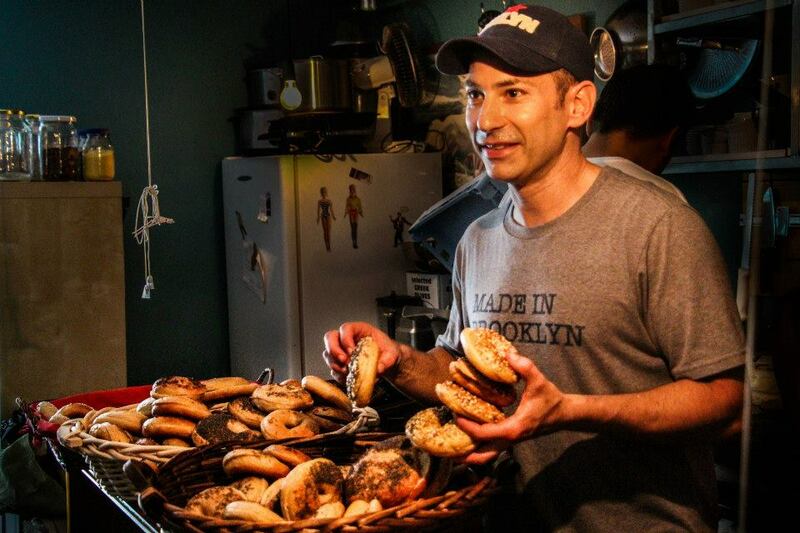 The best way to keep tabs on us is via our Brooklyn Boy Bagels Facebook Page. Whilst I would not wish to say anything that would detract from the enthusiasm shown by the baker or its customers I should point out that the NY bagel is not the bagel made in the haim. That is the bagel as known in the U.K and Canada, one that is baked to a hard golden and crispy outside, soft inside and smaller than the NY bagel. 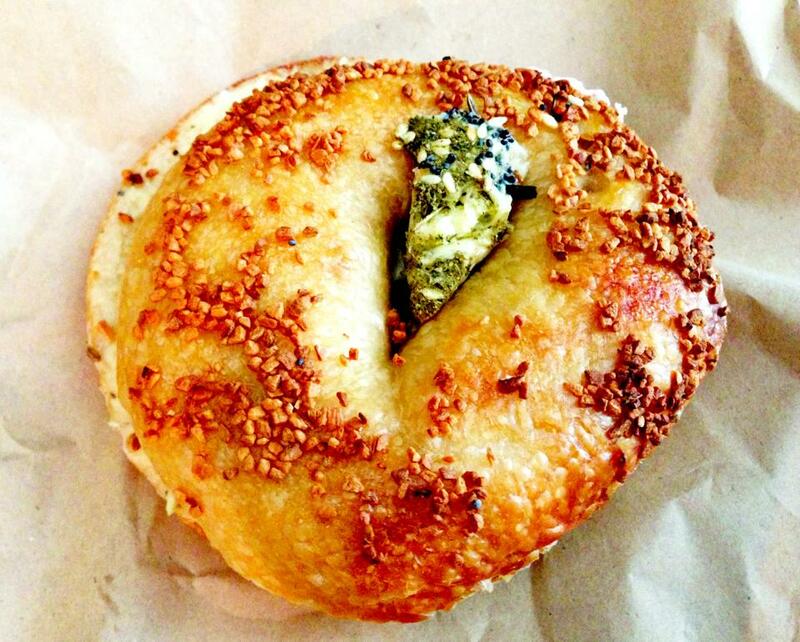 The Montreal bagel can be experienced at Mile End in Brooklyn and NYC. If the bagel boys could make an English bagel a lot of us homesick poms would be very happy. And by the way Schmeer refers to fat, usually chicken fat, that was used in place of butter on bread or bagels for dietary reasons. Not cream cheese. Things evolve whenever they leave they home country, so to say one bagel is the original or not really is beyond the point. I’m not sure if they even make the original bagels that were invented in Krakow, as many of the bakers were Jewish and fled to New York and Montreal. Both types of bagels, whether Montreal or New York, are beautiful in their own right. Montreal bagels are great for their woodfired tinge and romance, while New York bagels are amazing for their long, patient proofing (Montreal bagels are made very quickly over hours, and they’re fluffy like bread, as opposed to the chewiness of the New York style, which takes a minimum of overnight to prove). It’s like comparing New York coal-oven pizza to Roman pizza bianca, Chicago deep dish and a Naples margherita. They are all authentic and beautiful in their own way. As for “schmear”, you’re right in that the German word meant to spread fat or butter, but in Yiddish, schmear means to spread something, and originally referred to cheese. It’s not the work for chicken fat; that’s “schmaltz”. In New York, which is what I’m channeling at Brooklyn Boy Bagels, a schmear is the coined term used at any authentic bagel house, where they spread ungodly amounts of cream cheese on beautiful hand-rolled bagels (I usually buy one with a schmear and two without, so I can spread the cream cheese love). As for large New York bagels, they aren’t actually traditionally very big, but many a bagel has grown over time with the excess of American foods in general. You can still see their original, smaller size at bastions of tradition, most notably at The Bagel Hole in Brooklyn’s Park Slope. As for you homesick Poms, I’m working on some salt beef bagels for you lot. I don’t want anyone pining too long for their Brick Lane days of old! Thank you for responding. I will not argue further with one so committed to providing culinary excellence. My grandmother who came from Poland in 1895 and ran a series of ‘kosher’ restaurants in London with her children including my mother did use the word schmaltz for chicken fat, but when she spread it on bread it was always schmeer (no ‘a’). Now down to serious business, why can you not make a proper rye and caraway loaf dark brown and crispy on the outside and full of seeds. No one else does except for a German outfit in Adelaide and theirs is not the loaf you or I would recognise. I think you will find there is an unmet market. Meanwhile good luck with your endeavours and let us all know when the salt beef is ready. My grandmother is from Lublin as well. We’ll have to compare notes! I feel your pain when it comes to proper rye bread. I’ve got a couple of New York-style rye breads that I want to try to recreate – with caraway seeds, naturally! There are two main types: one’s a light rye and the other a sour rye. But I’ll keep a dark rye in mind as well, or at the very least give you a decent pumpernickel rye. We’re just waiting to find a proper bakery site where we have more room to play, but good rye is high on my list. Hope to see you at one of our Brooklyn Boy pop-ups soon. Our next one in Sydney is likely to be on Sunday, the 7th of July. Just check our Facebook page for an update, or try our home delivery service that we’re testing out in the Eastern Suburbs, Inner Sydney and Inner West. The rye I am dreaming of is what you would call light, only the crust is golden and crispy. Please let me have the contact number for the home delivery. Lublin, eh! Your grandmother was a Litvak then (and clearly much younger than mine). My people are from Lodz, that is real Poland! Perfect. I think we’re looking for a similar type of rye. Mine often had polenta (cornmeal) on the bottom for a bit of extra crust, but it was soft and airy in the middle. I’m sending you an email regarding orders as we speak. 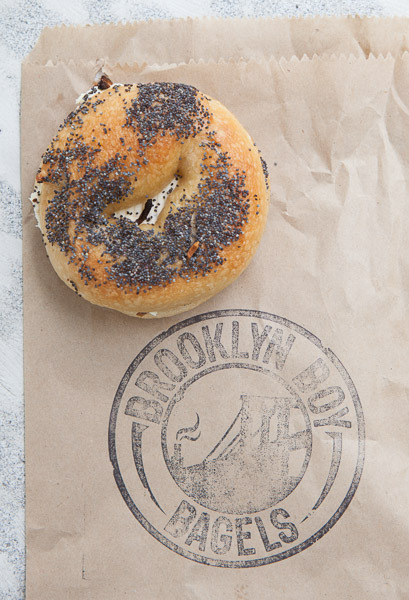 Just as backup, you (or anyone else reading this who’s hungry for a real NY bagel) can reach me at brooklynboybagels [at] gmail [dot] com. This is brilliant! NOTHING beats a NY bagel. Well done! Looking forward to popping in soon! Golly, I might have to move back to Sydney! You just made my day. Can’t wait to stop by! Awesome, Ashleigh! Looking forward to see you there for a bagel and schmear. Michael – I think this is fantastic. Can you ship a dozen to London? Haha – I’ll put it in the business plan, Tom! 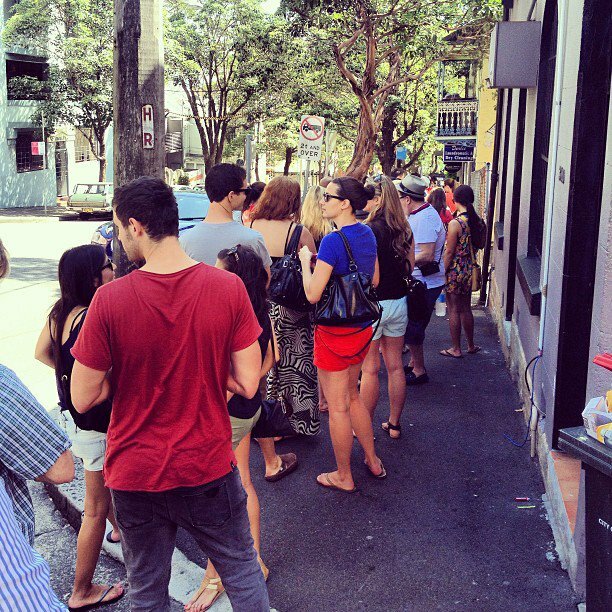 Let me know when you open a UK branch, you can’t get a decent bagel in this town.